No Other Old Car City Photo Workshop Offers This Much! Above: Old Car City. 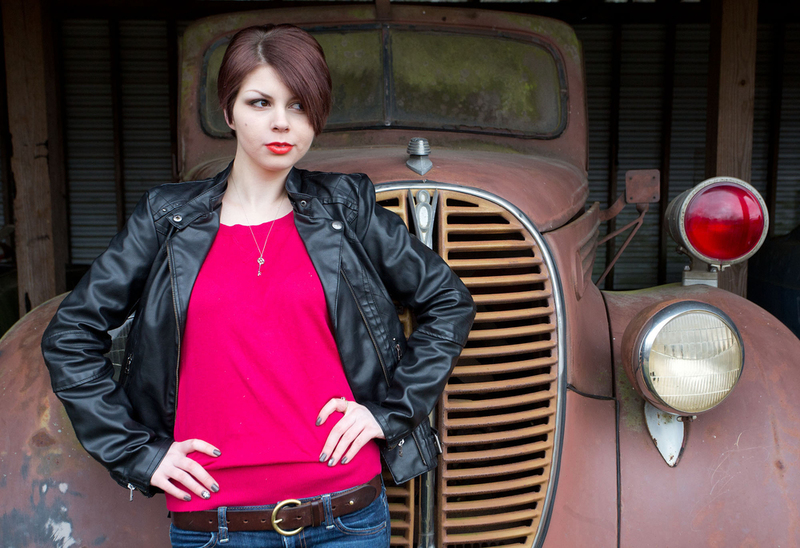 Model photography is included in my October 2015 Old Car City/Southeaster Railway Museum photo workshop. Canon 5D Mark III, 17-40mm lens. Registration is open for my October 2015 Canon EOS Destination Workshop: Capturing the Classics: Old Cars and Antique Trains. I can't wait to return to Old Car City and the Southeastern Railway Museum - both of which are located outside of Atlanta, GA. I'll be teaching: composition (the strongest way of seeing), "croposition" (combining composition with cropping), storytelling, lighting, HDR – and how to use reflectors, diffusers and speedlites when photographing a model. My friends from Canon will be there to loan you the newest cameras and lenses (including fish-eye lenses and super-wide-angle lenses) to photograph some of the oldest cars in the country. You will also have plenty of time to process your images – for our group slide show/critique session. And, you'll even get to make a print or two on Canon printers. No other Old Car City photo workshop offers this much. In addition to the teaching, model session, processing and printing, each workshop participant will receive an autographed copy of my three favorite books: Creative Visualization for Photographers, Exploring the Light and Travel and Nature Photography. In addition, everyone will also receive a free download code for two of my on-line classes: Master the Art and Craft of Bird Photography and Master Landscape and Seascape Photography - both available in my on-line store. All participants will also received an SD card loaded with Perfectly Clear (see my Plug-in page) for both Lightroom and Photoshop. Thanks to my friends at Athentech for your support! Total value of these items is over $250. Above: Lounge car, Southeastern Railway Museum. Canon 5D Mark III, Canon 15mm lens. Here's a look at some of my favorite photographs from my previous trip to Old Car City and the Southeastern Railway Museum. The lounge car photograph (above) and the mail car photograph are HDR images, created in Photomatix. I recommend Photomatix for this workshop. You can get a discount on Photomatix on my Save on Plug-ins page. Above: Old Car City. Canon 5D Mark III, Canon 17-40mm lens. I removed some of the reality from my images in this post either by using a fish-eye lens, by altering the true color of a scene, by applying a plug-in, by shooting HDR, by selectively blurring parts of an image – or by using a combination of all these techniques. I can show you how to apply digital enhancements during the workshop. Of course, I'll show you how to get awesome in-camera shots, too. Above: Southeastern Railway Museum. Canon 5D Mark III, Canon 17-40mm lens. About removing some of the reality from a scene: When we remove some of the reality from a photograph, the photograph can - but not always - look more artistic. Photoshop, Lightroom and plug-ins make creating artistic images relatively easy - if you have a creative vision. Above: Old Car City. Canon 5D Mark III, Canon 24-70mm lens. On my workshops I stress light and composition, the topics of my two latest classes on Kelby Training. The picture above (taken on my previous workshops) of our model Hanna (she's coming back for this workshop) illustrates the benefits of shooting on an overcast day, when contrast is low. It also illustrates creative composition: shooting at an angle creates a sense of depth in an image, the Bel Air insignia adds a sense of place to the image, and shooting at eye level helps the viewer of the photograph relate to the subject. Above: Old Car City. Canon 5D Mark III, Canon 17-40mm lens. Effects added with Nik Color Effects Pro. Several Photoshop CS6 enhancements. Above: Old Car City. Like abstracts? You will find them in pealing paint and in rust at Old Car City. Another element of photography we talk about on my workshops is the importance of cropping. In the above photograph, the extremely tight crop (I know it's extreme) emphasizes the fins and tail lights of this cool Caddy. Yes, the railway cars and old automobiles are awesome subjects. But hey, I especially enjoy photographing people on location. That is why I was so glad our model Hanna is returning! I hope to see you at Old Car City and at the Southeastern Railway Museum - where we not only make good pictures, but where we also have a ton of fun. If you can't make that workshop, all my workshops are listed here. If you have any questions about this workshop, or any of my workshops, give me a call at 914 271-6132. Note: I'm in the Eastern Time Zone.